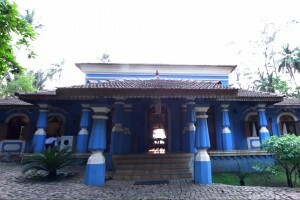 This offering is of a three-bedroom villa located right on the popular Vagator Beach. The luxurious villa can accommodate up to nine people. The rear porch houses a private pool with wooden decks, set in the midst of a well-maintained lawn. The villa is equipped with a fully functional kitchen for added convenience, and has ample parking space. 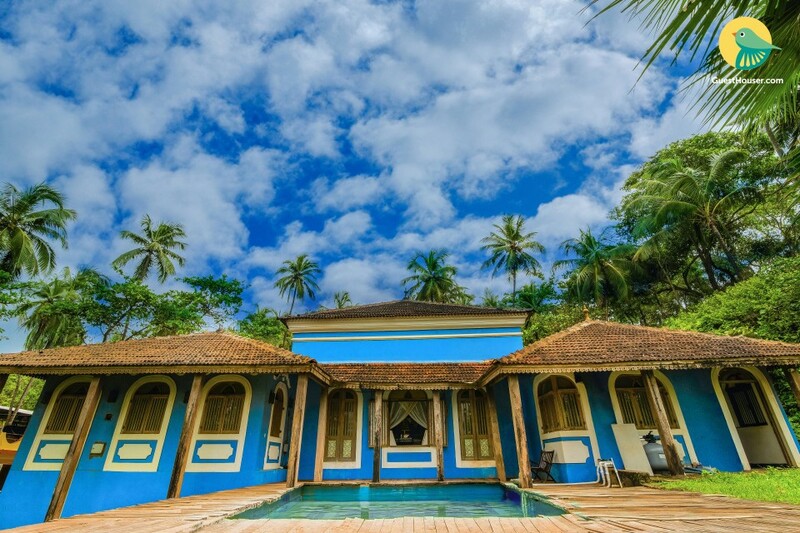 Your Space Nestled in a lush green expanse against a backdrop of tall palm trees, this Portuguese villa is painted a vibrant Mediterranean blue with tiled pyramid hip roofs adding to the traditional charm. Arched cement window panes house wooden windows, while teak pillars with intricately carved awnings add to the classic appeal of the facade. Inside, you are greeted by an expansive living room, with a high raftered bamboo-and-wood ceiling and wide wall arches that house arched doorways, creating a lovely dramatic effect. 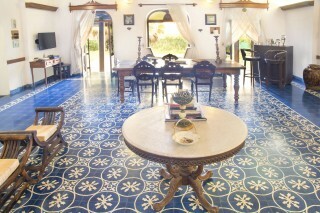 The gorgeous flooring flaunts pretty azulejo tiles in a floral pattern, and creates a striking decor dimension. The entire space is furnished with antique furniture, from the cane-backed ornately carved loveseat with a pair of Victorian armchairs and antique x-frame stools, with cushions for added comfort. A lovely walnut-wood baroque marble top pedestal table occupies centre stage, while a large six-seat dining table with Queen-Anne chairs make mealtimes a delight with your travel companions, with tall carved-wood candelabra ensuring the table is well lit. An antique cane recliner sits close to another arched wall alcove, giving you a convenient spot to put up your feet and read a good book. A couple of tall bar stools accompany a bar cabinet, which sits up close to the generous windows dressed in pastel sheers for a sublime effect. The villa is equipped with a modular kitchen, with granite counter tops, a gas hob, a large double door refrigerator, and essential crockery and kitchen ware to ensure you can conveniently whip up a meal if you like; the hosts also provide a chef on request. The three bedrooms on offer can accommodate up to nine people, and are furnished with beautiful antique four-poster beds, carved claw-foot armoires, vintage writing desks with intricate wood-inlay work, chest of drawers, and console tables, with the azulejo tiles continuing into every room. The en suite bathrooms are delightfully eccentric, with exposed-brick masonry, rustic stucco walls, and old-style fittings combined with modern sanitary ware. Some of the bathrooms boasts sunken baths, in case you are in the mood to indulge in a relaxing bubble bath. On a hot sultry afternoon, take a cool dip in the hamam-style private pool, with teak decks and an azulejo bottom for a pretty effect. If you are on a road trip, the host provides ample parking space for your vehicles. A perfect combination of luxurious and traditional, this Portuguese villa is sure to enhance your travel experience. Throw your own little pool party and have the time of your life in this tastefully decorated property. Guest access - You are allowed access to the entire property on offer that consists of a private swimming pool, a small garden, three beautiful bedrooms, a living room, a kitchen, and well-appointed en suite washrooms. Guest interaction - We provide you with the services of caretakers and co-staff to assist you, maintain cleanliness, and help you with your itinerary. Also, we are just a phone call away. Getting around - Our holiday home is 45.1 km away from Goa International Airport. You can hire a cab from here and reach the property conveniently. Also, we can arrange pick up and drop service at an additional charge. Thivim Railway Station is 18.9 km away, and the nearest bus stand is Mapusa Bus Stand (9.5 km). Additional information - Some of the house rules are- 1. You are requested to provide a valid ID proof at the time of check in. 2. Our standard check in time is 12 pm and check out is 11 am. 3. Housekeeping staff is present at the property to assist you. We request you to be courteous with them. 4. Please treat our villa as you would treat your own home and help us keep it beautiful. 5. Please refrain from bringing your own pets. Guests are requested to provide valid identification at the time of check-in. There's a driver available on request. The same is chargeable. Pick and drop can be arranged on request and on chargeable basis. Services of a chef can be provided too on request and on a charge of 1000 per day. Bike/car hire is nearby the villa. "Unobstructed beach view from living room, ideal for sundowners"
This place is just where you would want to be! It’s grand and beautiful. The bedroom and dining room is luxuriously built. There’s everything in close proximity, from markets to designer boutiques! The caretakers take care of your room, the food and all that you need. Had an amazing experience! I stayed with my friends in this beautiful villa. We had a wonderful stay in the Villa. Everthing was there that makes a stay perfect. The villa is very neat and clean and we felt like living in our own home. The Vagator beach is just 2 minutes walk and there are very good restaurants within 5-10 minutes walk. The caretaker's family lives nearby and is very helpful...Call him anytime and he will be there to help you out in every possible way. It was worth staying in the Villa. 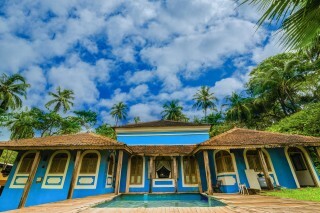 I would love to stay here only whenever I will come to Goa and would definitely advise my dear ones to stay in this Villa. I really enjoyed the stay at this beautiful Villa. Everything was there in the Villa to make a holiday perfect. The services were really good.The care taker was really helpful and friendly. 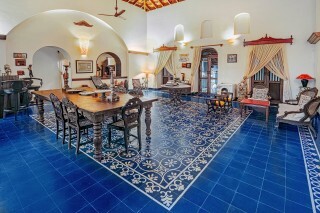 The interiors of the Villa were really beautiful and gives the local Goan touch during the stay. The beach was just 2 minutes walk and market was nearby. 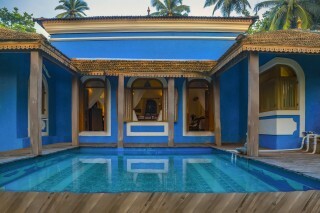 I can say it was "VALUE FOR MONEY" and I would definitely like to stay in this Villa again during my next trip to Goa. 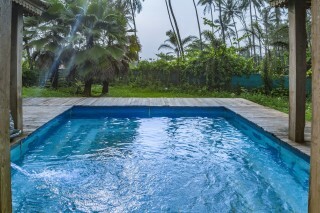 Located at a stone's throw from the Vagator Beach, this villa has a mesmerizing view!! The plunge pool with the wooden deck, with the beach at the backdrop, provides an amazing setting for pool parties. The villa is themed in a very old fashioned way and at first we felt it was quite spooky but eventually we started loving the place and had a great time. Do go for it with your eyes closed.. You will love it!! me and my team is here at december...i love to stay here again and again... location is fantastic at vagator beach. all good points is near by this guesthouse like mango tree resto and fort. about this bunglow i love the way to what they done interior. just one probs is there which is cleanliness. and whattta pool... me my team use to sleep arround that poool. overall i give 3.5 star. I booked this property but I got some other property , I am not satisfied at all as I paid for this property and suddenly they call me and say that it is not available so they gave me new property but it was fine and good experience as guesthouser helped me to get a good accommodation . The villa was really well maintained and cleanliness was upto mark. It is right outside vagator beach. 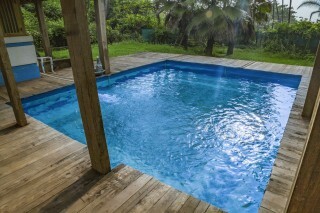 We had worries about the pool size, it is not deep but big enough for 6 people to enjoy thoroughly. Talking about the service, everyone we interacted with was very helpful and polite. Beautiful, Elegant property to spend your holidays. From rooms to interior, food to ambience everything was just awesome !! A place where one can stay for ever n would love to go again and again. Location is another key highlight, its close to beach and market.. Had a great time !!! The location of the villa is amazing! The sleep quality is nt tht good and electricity and water is a serious issue here, since we dnt hve to stay there fr whole day it ws all good! The roof is made up of tiles, so if u r planning to stay here in monsoon, u will regret! Wow this was a wonderful visit with family and ensuring family enjoyed it was very important. The villa is look away from the beach and the ancient look within the house was wonderful, the private pool in the villa is also a great thing and perfectly value for money . Property is very beautiful , have all the amenities available and also everything was just perfect in there , and we were really happy with the facilities in that price , just want to share that if there was someone with caretaker for help it would have been better. My experience was good as property was really nice, spacious and also had all the amenities available , not just that care taker helped us really well and the locality was very calm too, we just the loved our property which was really nice . I had a fantastic stay at the villa. The villa had so beautiful interiors along with spacious rooms. All the amenities were provided and the host was also very nice person. Good services Guesthouser, look forward to book again! Value for money and very cooperative staff.. Awesome location and very well maintained property.. Had a great time.. U changed my thinking that only 5 star property can offer luxury. Thank u guys.. Keep up the good work.. Overall the stay was very good. All the amenities were there and it made our stay wonderful. The beach as well as the market were at a walking distance. The Villa was very neat and clean. The care taker was very helpful. I stayed with my friends for 4 nights. This is the place where u need to be in Goa, awesome place. There was a small problem of drainage system of the villa other than that everything was perfect. Must stay! the best place to stay in goa. were a group of 8. had a blast. wonderful location. beautiful rooms and lobby. functional kitchen. it could not get better. been trying to book for trips and is always booked. The property was nice , clean and we enjoyed the whole trip but the only thing was that the hosts were not aware that we are coming , else it was a good trip , services were according to our needs . I faced few difficulties like staff was not at all cooperative although rooms were clean , spacious , locality was also nice , so for me it was an average trip which I booked through guesthouser. It was a good property , completely value for money and also it was really clean near to the beach and also it was completely the same as it was on the website , so I was really satisfied . It was an wonderful experience staying at the villa. My family had an awesome time.. Especially the room quality ...friendly caretaker and nice pool area. Kids enjoyed playing in the pool. Very nice place... Just the mattress in one room needs replacement as its all spring but no cushion on top. Other than that the place is very good And as described. It was really nice trip and I loved it completely, rooms , view and locality everything was just perfect for us and also I want to book few more trips soon. I like the villa but AC was not working in the bedroom and there was some issue with the powerline, housekeeping was not upto the mark. Very nice bungalow near Vagator beach. Plunge pool is very convenient for kids. Property is a bit older than what the pictures show. My stay was nice in this property and also the place was clean too. I enjoyed my trip and is planning to go again soon . The place is easy to reach and find out. The villa was good and beautiful. It could have been better though. The villa was very well kept and lived up to the promise.. Very comfortable, homely and good support staff. Overall experienced a good stay. Huge disappointment - inside swimming pool was not in working condition!!! It was great actually, i stayed for the first time in some portuguese villa. It was a good property and we really enjoyed the whole trip. Thivim Railway Station is approximately 16 kilometers from the property. Goa International Airport is approximately 40 kilometers away.